Have you ever tried to quickly plug in a USB cable? You would think it only takes two tries, but for some reason I find myself having to flip the cable over and over and over and over until I get the right orientation. 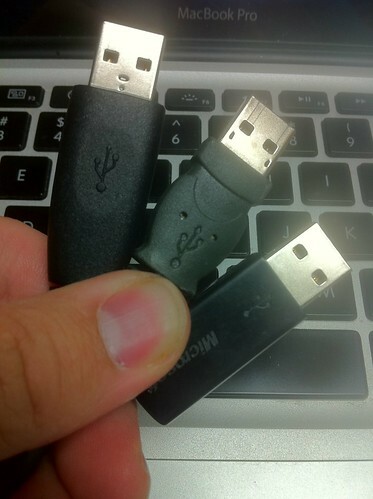 There’s actually a very easy way to tell which side is “up” on any USB cable. Look at the top of your next cable. On one side is the manufacturer’s logo, and on the other is the USB symbol (sometimes with another manufacturer logo underneath the symbol). 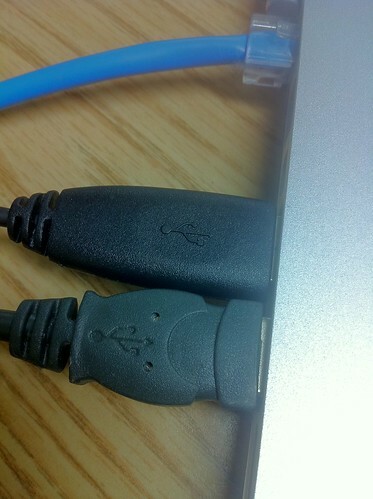 The USB cable always plugs in with the USB symbol facing UP on your laptop. If you have a vertical monitor with USB ports, the USB cable always plugs in with the USB symbol facing you. UPDATE 10/06/11 part 2: Made it on Lifehacker! Booya! Well, not always. As an IT guy, I have worked with a lot of PCs and I would say it is true for 80% of the hardware we have. For some reason, for a few models of the netbooks and odd ball laptops we have, the ports are upside down. I hate exceptions to the rule. I found 2 devices that were opposit on my desk. A cable from Western Digital and a card reader from Kingston. A tip is to add a drop of glue from a glue gun indicating which side is correct. By feeling where the glue bump is, you’ll know which way to insert it all the time. Ta-Da! I keeps my hot glue gun in a quickdraw holster just for jobs like this. Very cool post. I just recently started following your blog, but I look forward to contributing more in the future. I usually stick one of those round colored stickers on the cables – it’s easy to see and surprisingly, fairly easy to feel if you can’t see what you’re plugging.